UHawk VR Development Blog – This is where I write longer posts about the development of my game UHawk VR. 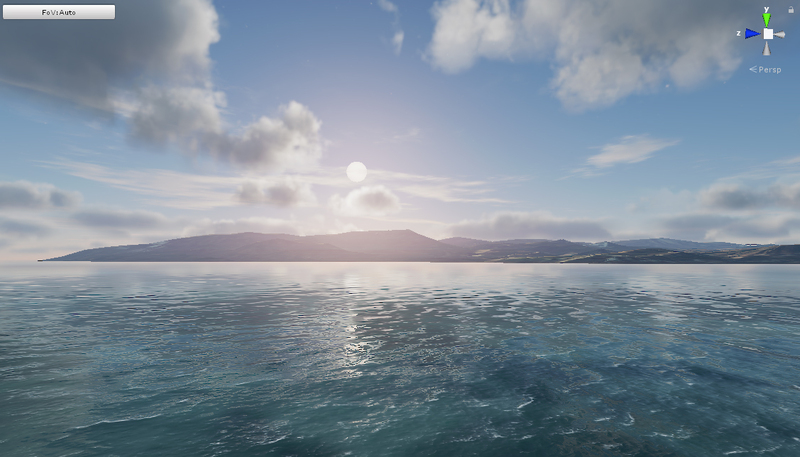 I spent some time trying to improve my water shader recently, and found there were two problems I had yet to solve in a satisfying way. This post covers the first of them. There has been extensive research done on the subject of real-time reflections, with no “catch-all” method available. 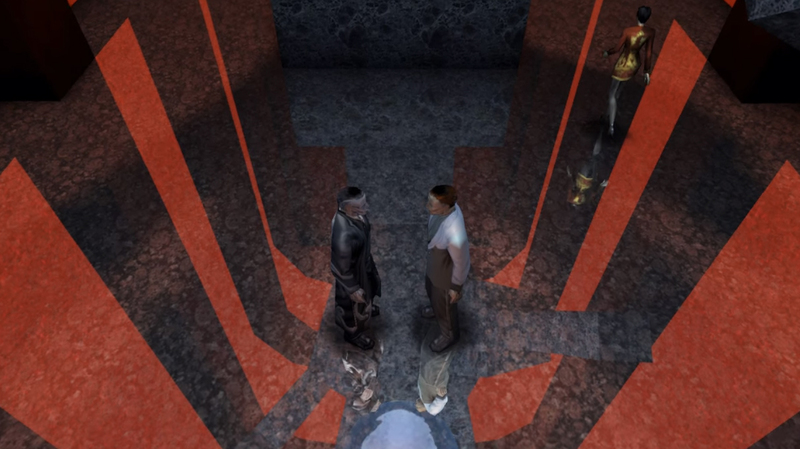 Early 3D games had no problems rendering “proper” planar reflections due to their simple nature but as the complexity of our scenes grow, so does the cost of these type of reflections. 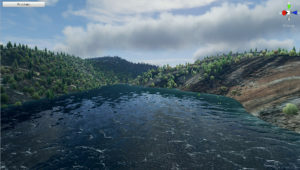 You can’t “just render the scene twice” if rendering the scene once already costs 90% of your resources. Planar reflections also have their problems, mainly that they can be hard to manage, and are limited to reflecting off a single surface with the same surface normal. 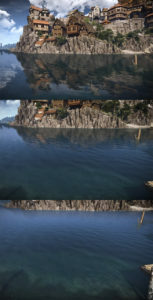 If you want multiple reflections, you have to do multiple renders. The shift towards deferred rendering, which itself isn’t very compatible with planar reflections, has given popularity to a method of rendering reflections called screen-space reflections (often abbreviated as SSR). 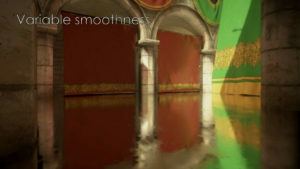 This method uses the pixel normals and depth to calculate “screen-space” reflections, by ray-marching the screen buffer after the scene has rendered. It is very compatible with deferred rendering (since the g-buffer provides the necessary data) and although it requires a lot of samples/filtering/tweaking to look good and still counts as a high-end effect, at least it doesn’t require rendering the scene twice. It also handles reflections in any direction and is independent of scene complexity, much like screen-space ambient occlusion. The bad with SSR (and this is a big bad, if you ask me) is that because it is screen-space, most rays will fail to hit what they “should” hit, and many will not hit anything at all. Surfaces which cannot be seen (off-screen, behind other objects etc.) cannot be reflected and so you end up with a kinda-sometimes-works-reflection solution. It is also prohibitively expensive for VR, and the inconsistent reflections end up very distracting. Alright, so that seems like quite the task. Turns out though, it’s actually rather simple. Screen-space reflections use a technique called ray-marching. This is a form of ray tracing where you take discrete samples of some data as you travel along a ray to determine if you hit something. The reason SSR reflections disappear is because of lack of data, not because there is something wrong with ray-marching. What we need is some form of data which is available anywhere, at any time. If we upload our terrain height map as a shader parameter, we have exactly this. We can now do ray-marching, and for every step we check the current ray position against the terrain height value. If it is lower, we know we intersected the terrain. For our final intersection point it’s a good idea to pick a point between the last ray march position and the one that was below the terrain. 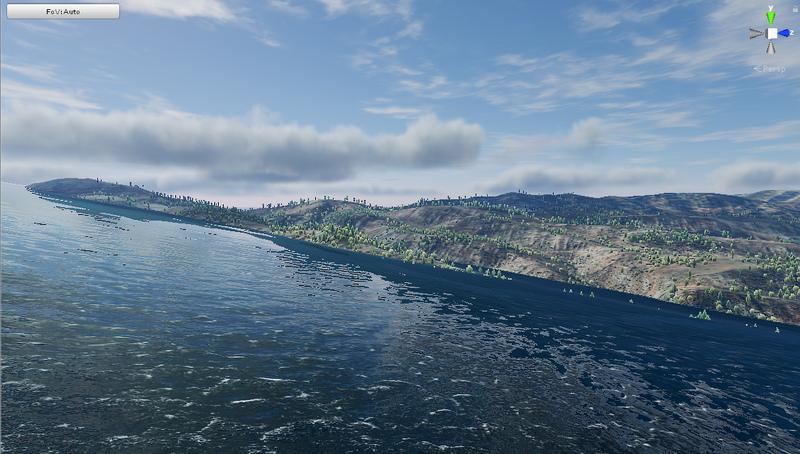 This will give us a slightly more accurate reprensentation of the terrain. This can be improved upon further by stepping back and forth a bit to find the “true” intersection point, however for reflections I’ve found that just interpolating between the two works fine. Much better! 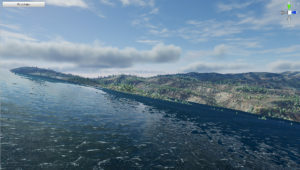 It is now obvious where the terrain sits in relation to the ocean. Water plane at high altitude. Hidden mountain lake, perhaps? Slanted water plane. I would probably pack my bags if I lived here. I haven’t done rendering timing, but the effect works with just 16 ray-march steps and so has no noticeable performance impact on my machine. I imagine you could do down-sampled rendering to make it blazingly fast even with a high sample count. What should the reflection color be? The reason I don’t is just to save some performance and texture lookups. What about ray-march step count/length? I imagine this could be improved a lot. Since it works the same way as screen-space reflections, I would look to such implementations for info on this. Tricky. Probably best to render the reflection to a separate buffer and do post-processing on it. Same problem applies when rendering planar reflections so I imagine there are resources available online on this. GetTerrainHeight is a function which returns the terrain height at that world position (this is where the terrain height map comes in). 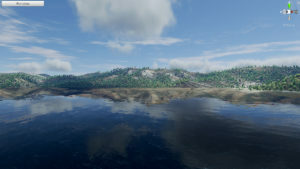 GetReflectionColor just returns unity_AmbientSky * 0.35 in my case. What about reflecting objects other than terrain? Tricky, but not impossible. I’ve done some testing using Signed Distance Fields, and I think the results are promising. My test scene uses an array of parameters which describe proxy SDF cubes. I already had this set up since I use it for generating terrain shadows and AO on the GPU, so it was just a matter of firing an additional SDF ray. 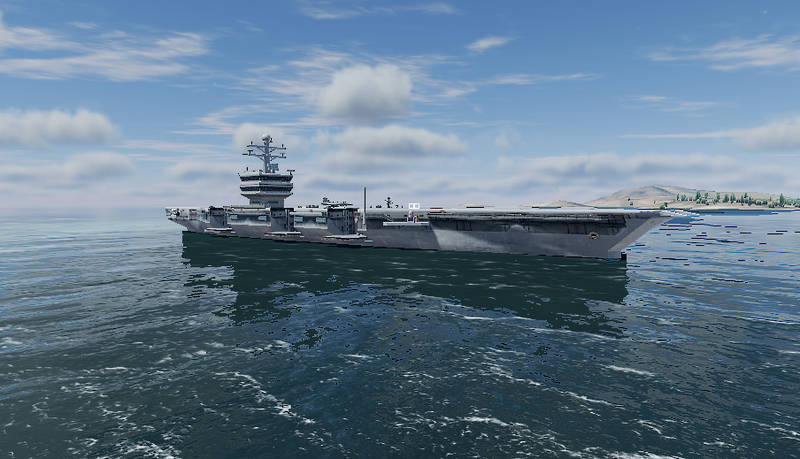 Reflecting an aircraft carrier using SDF proxies (3 cubes). 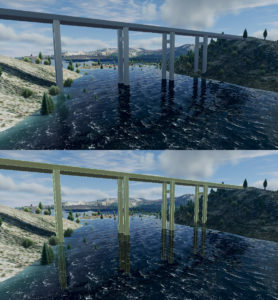 Reflecting a bridge using SDF proxies (visualized in the bottom image). This runs at real-time but is too slow for a practical application (much less a VR game). I imagine you could get pretty decent performance if you use precomputed SDF textures instead. I will probably get around to trying this eventually. 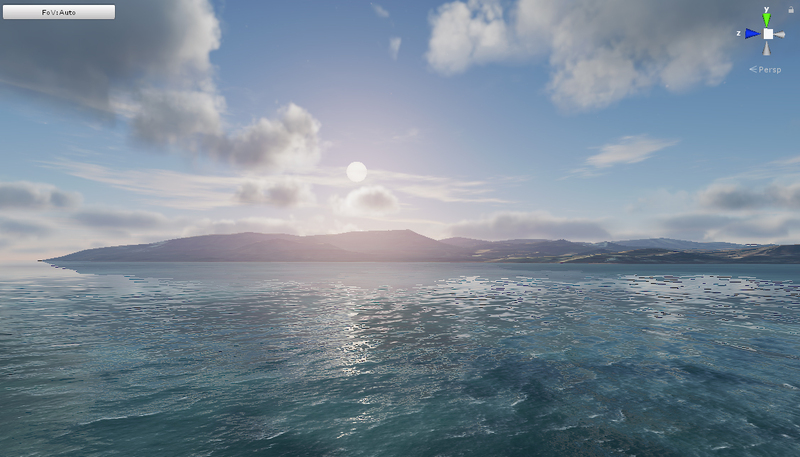 In the next post, I’ll show you how we can use the terrain height map to improve our water shader even further by generating shorelines and a projected ocean floor. Stay tuned! Wanting to share some longer thoughts on the development of my game I figured Twitter wouldn’t do any longer, and so I made this blog. It will consist mostly of breakdowns of the technical aspects of the game but probably some other stuff as well. The game itself is in a pretty good state right now. I’ve held out on recording another video as I’ve been working mostly on necessary stuff that I’ve put off for long, like core gameplay systems and editor tools. 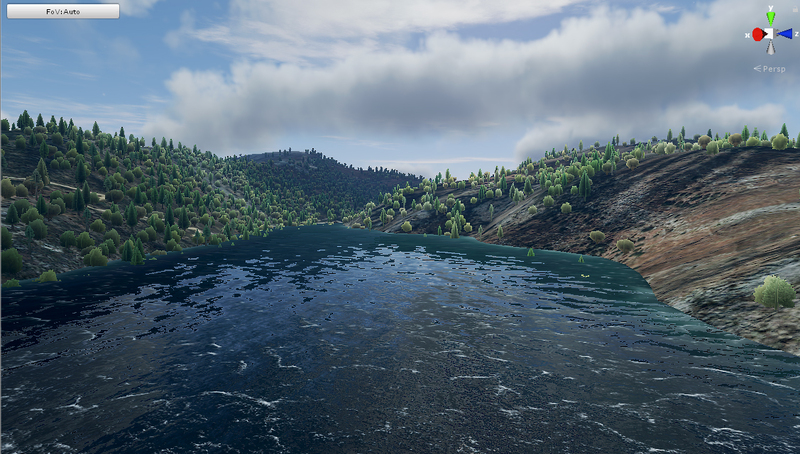 Right now I’m in the middle of a performance pass after having added some new graphical features (which I will be making a post about) and I’m happy with how the game looks and feels. I recently added enemy fighter AI which turned out to be really fun to go up against. I’ll be making a post and video about that as well after I’ve completed some work that remains to be done. I had set a goal of releasing a demo at the end of august, but I’ll have to delay that by about a month to ensure that it is a smooth enough gameplay experience. The demo will consist of a short mission with both air-to-ground and air-to-air combat, and I will be using it to gather some input on how the game feels and runs. I don’t want to make any promises that it will be released in September but I’m confident it will be out around that time, so please look forward to it. UHawk VR models and simulates real-world aircraft and weapons. The product names, logos, brands and other trademarks depicted or referred to in the game or in its ancillary materials are the property of their respective trademark owners. These trademark owners, and the manefacturers of the aircraft and weapons used in the game, are not affiliated with the producer of UHawk VR and do not endorse or sponsor the game.